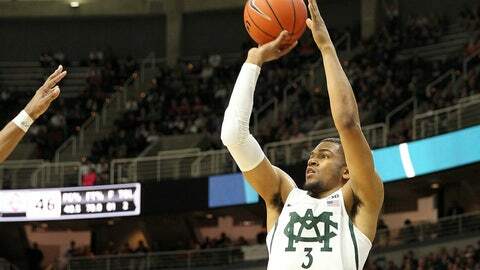 Michigan State's Alvin Ellis scored 15 of his 18 points with a 3-point barrage in the first half and finished with six 3-pointers. EAST LANSING, Mich. (AP) — Alvin Ellis chose to stay at Michigan State, resisting the urge of following two of his former teammates and transferring to another school. The Spartans are glad he did. Ellis scored 15 of his 18 points with a 3-point barrage in the first half and finished with six 3-pointers — doubling his previous career high — to help Michigan State beat Ohio State 74-66 on Tuesday night. Ellis watched Marvin Clark Jr. and Javon Bess transfer after last season, going to St. John’s and Saint Louis, respectively, and decided to finish his career at Michigan State. Ellis scored a career-high 20 points in the Big Ten opener, helping the Spartans rally to win at Minnesota. He didn’t score as many points against the Buckeyes, but he had the best shooing stretch as a Spartan. Ellis made five 3-pointers in a 3:38 span of the first half, helping the Spartans take a 21-12 lead and stunning the crowd and the Buckeyes because the senior was averaging just six points a game. Ellis finished 6 of 9 beyond the arc and 6 of 11 overall, falling two points shy of his career high. “He was on fire,” Ohio State coach Thad Matta said. Miles Bridges had 17 points and 11 rebounds and Nick Ward scored 15 for Michigan State (16-10, 8-5 Big Ten), which has won four of five. Ohio State’s Marc Loving scored 22 points and reserve JaQuan Lyle scored all 10 of his points in the first half after missing the previous game, a setback to No. 23 Maryland. The Buckeyes (15-12, 5-9) have lost four of six. After the Ellis-led surge for the Spartans, the Buckeyes scored 10 straight to take the lead before falling behind 40-34 at halftime. The Spartans scored the first six points of the second half, building a 12-point lead. Ohio State, once again, rallied with a 17-6 run to pull within one point. Michigan State finished off the Buckeyes by outscoring them 12-2 to take an 11-point lead and they were able to keep a comfortable cushion. A message seeking comment was e-mailed to ESPN. More than an hour after the game, Dakich appeared to delete the aforementioned tweet. Ohio State: The Buckeyes, who played in the NIT last season, are in danger of failing to make the NCAA Tournament in two straight years for the first time since Matta took over the program in 2004. “I think we’re making progress, but obviously we’re not there yet,” Matta said. Michigan State: The Spartans have improved their chances of extending their NCAA Tournament streak to 20 with their recent surge of success. Ohio State: Host Nebraska on Saturday. Michigan State: Play at No. 16 Purdue on Saturday.